A rare engraving of ‘Canterbury’s Magna Carta’ of 1215 has been saved for the Kent city after it appeared in a sale at The Canterbury Auction Galleries. The rare engraving of ‘Canterbury’s Magna Carta’ of 1215 which was bought by Canterbury Cathedral Archives for £3400 in The Canterbury Auction Galleries sale of November 28. 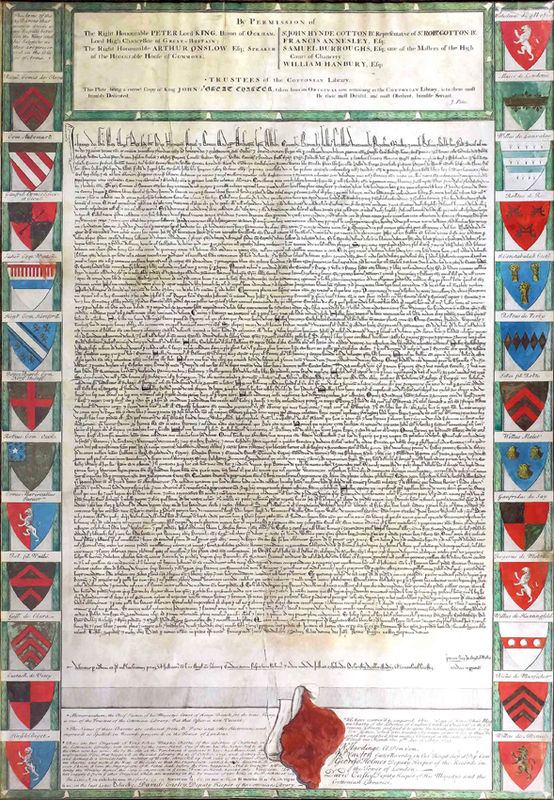 The facsimile of what is regarded as the most celebrated legal document in the English-speaking world was purchased by Canterbury Cathedral Archives with funds from The Friends of The National Libraries, and the Friends of Canterbury Cathedral. It sold for £3400 on November 28 against an estimate of £3000-5000 after being discovered at one of the auctioneers’ free Friday valuation mornings. Printed on vellum in 1733, the engraving is a facsimile of what experts have established was the copy of Magna Carta preserved originally among the cathedral’s records, perhaps having passed through the hands of Archbishop Stephen Langton (1150-1228). Only four copies of the original 1215 Magna Carta survive. One is owned by Lincoln Cathedral, another by Salisbury Cathedral, while the remaining two are held at the British Library in London. However, the Canterbury Magna Carta, the only one to have the Great Seal of King John still attached, was damaged in a fire in 1731. A failed attempt at restoration in the 1830s rendered it barely readable by the naked eye. This makes the 1733 engraving particularly important. The engraving in the auction was made by John Pine (1690-1756) a publisher, print and map seller, who was also Bluemantle Pursuivant at the College of Arms, and Engraver to the King's Gignet and Stamp Office. It is a first striking, produced importantly on vellum, in 1733. After that date, what further copies exist were printed on paper. Williams thanked the Friends of Canterbury Cathedral and the Friends of the National Libraries for their support and also The Canterbury Auction Galleries for waiving its buyer’s premium to “help bring a Canterbury Magna Carta back home”.